The Mines Press collection of laser checks is guaranteed to meet all of your firm's printing and security specifications, regardless if it's a payroll check, account payable check or multi-purpose laser check. We have been one of the leading providers of preprinted and blank business checks for law firms for over 30 years, and that's not about to change. In order to manage your firm successfully it’s important to utilize all of your assets in the most effective way possible. This means simplifying every process in your business’s systems—from scheduling to payroll. Our laser checks are guaranteed to severely improve security and reduce overall cost. They are formatted to be compatible with all of the business financial software in use today. We can also design your checks to work with any custom-built layouts and software programs. 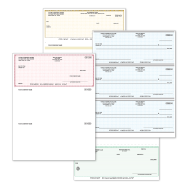 *Please note: Our checks can be designed to work with any software or custom layout. If you don't see what you are looking for, give us a call. We can still provide you with great service and help meet your company's needs at no extra cost! 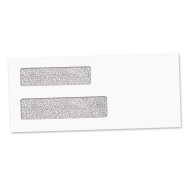 Warning Band – Indicates that the face of your check has a colored background and an artificial watermark on the back. "Intricate" Borders – Each border contains the hidden words "ORIGINAL DOCUMENT." 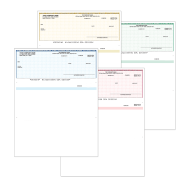 Micro Printing – The bottom border of the check is made up of the words "ORIGINAL DOCUMENT," which can only be read with a magnifying glass, running across the entire bottom of the check. Artificial Watermark – A crisscross pattern reading "PROTECTED DOCUMENT" (not shown). Thermochromic Printing – The red "padlock" logo on the back of the check is printed with a heat-sensitive ink that reacts to your body's warmth. The logo fades when it is warmed by your finger or breath and reappears when the check returns to room temperature. Micro Printing – The line below the words "DO NOT WRITE/SIGN/STAMP BELOW THIS LINE" is made up of the words "ORIGINAL DOCUMENT," which can only be read with a magnifying glass. Ordering printed or blank laser checks from the Mines Press means security, supported by the best quality and at a truly affordable price. Order yours today!